The following is a list of sites I highly recommend to read which shows why I have been rearing my dogs in an All-Natural method. Included at this point is also websites for holistic and homeopathic products. I will add notes to what products I use for the Clumbers and found to be highly effective. Keep checking back as I get myself organized and add more! 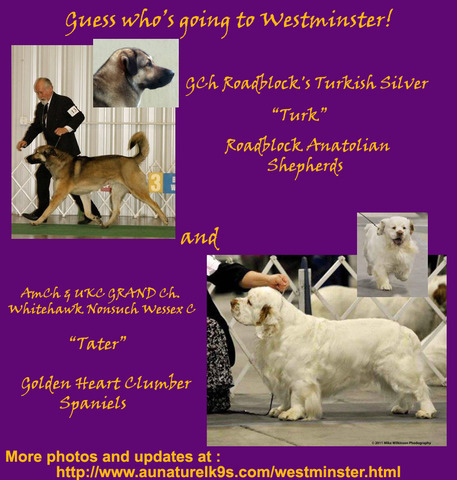 Below is an ad done by the yahoo & Facebook group I have been a member of for over 10 years -- celebrating two of their totally Natural, raw-fed dogs going to The Garden in 2012. MUSCLE BUILDER -- for muscle support for that heavy body on short legs. There are several other products at Natures Farmacy I use according to what is needed for each individual dog.